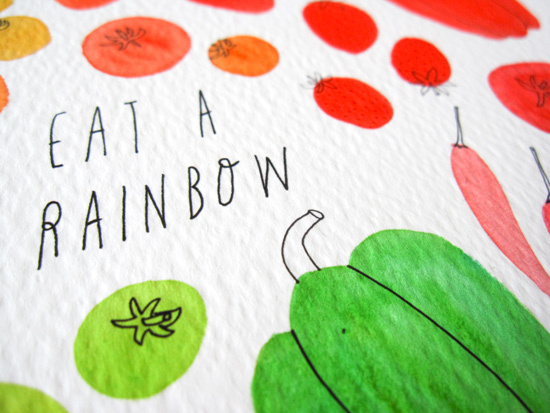 My new art collection, Eat a Rainbow, will launch exactly two weeks from today on Sunday May 1! By the way, if you’ve missed the previous behind the scenes sneak previews, you can check them out here and here. 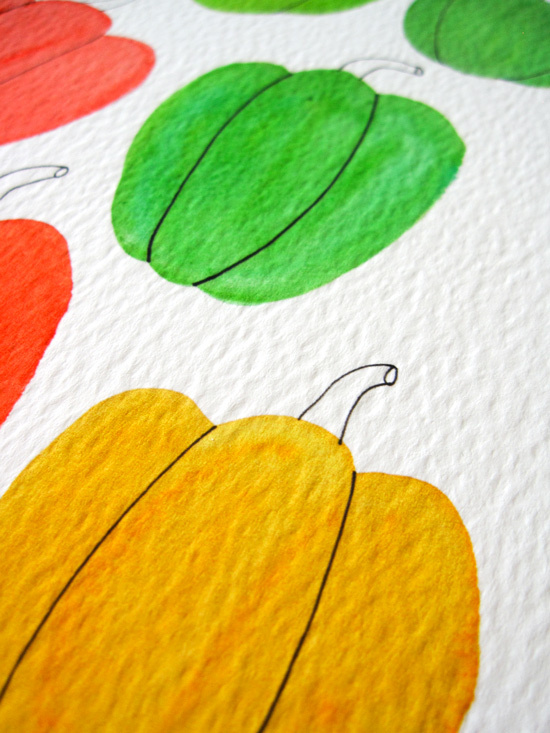 Today, I want to introduce you to my new notecards! 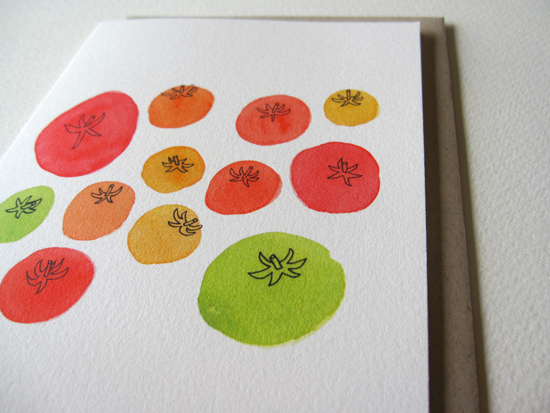 Eat a Rainbow, Bell Pepper, Summer Berry, and Tomato Notecards! 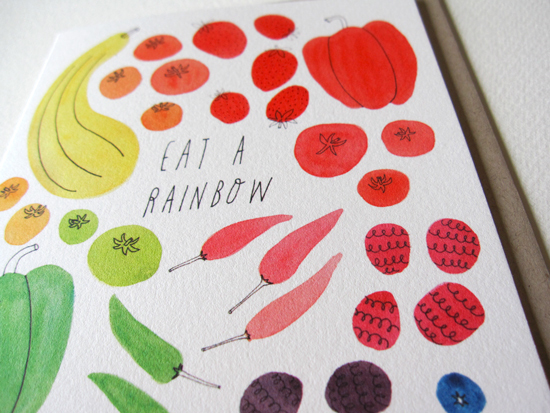 Just like my new art prints, the notecards come in 4 new designs: Eat a Rainbow, Pepper, Tomato, and Summer Berry. 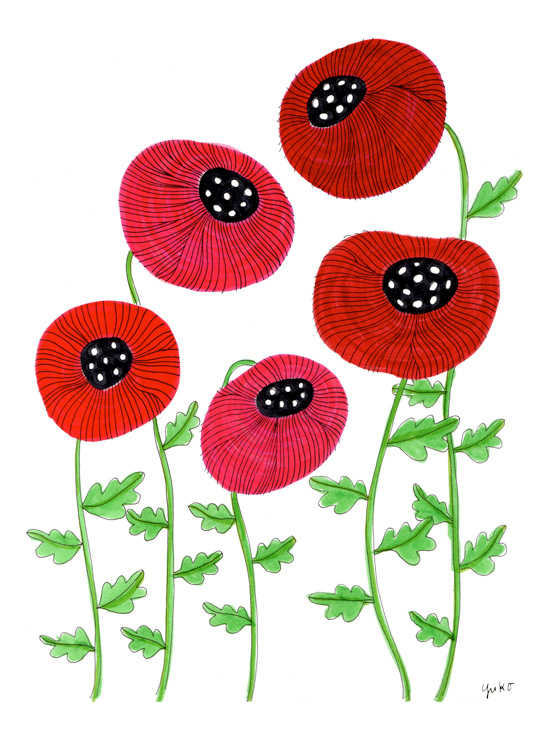 These are going to be available as single card or as a set. I mean how could you choose, right? I love pretty notecards. Whenever I’m at a craft show or visiting a cute gift shop on vacation, I pick up a few. They’re like a tiny gift of art that is also practical. But I also admit that I have piles of pretty notecards I have accumulated over the years. If you’re thinking – what do I do with more notecards? Fear not. 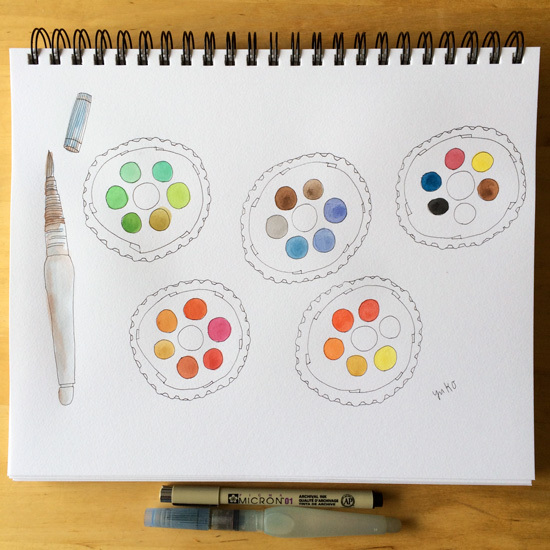 I’ve compiled 6 creative ways you can use these watercolor art notecards this summer! 1. Start a new tradition and send your handwritten season’s greetings to your friends and family during the summer. Do you send your family and friends greeting cards during the winter holidays? Well, it’s been almost 6 months, isn’t it? How would they feel if they received an unexpected season’s greetings from you this summer? I would think happy, delighted, and loved. 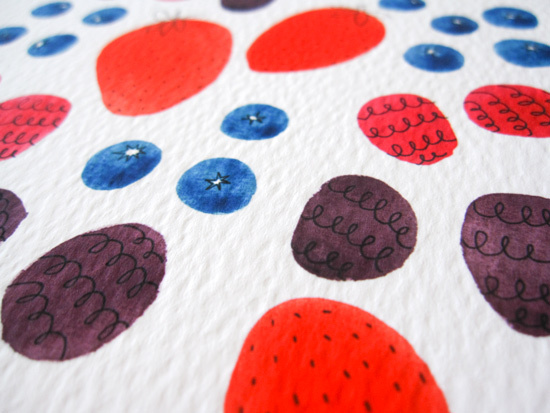 Help them cool down with these refreshing watercolor art notecards! 2. It’s a perfect summer birthday card. 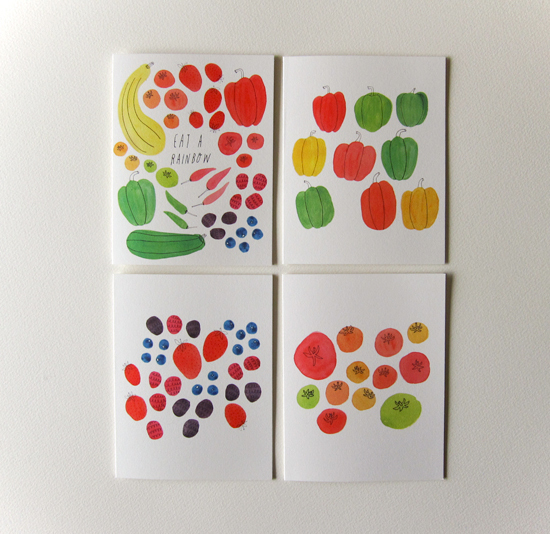 Each of the notecards feature my colorful and refreshing drawings of summer’s bounty and makes a perfect summer birthday card! 3. Write a thank you note to your neighbor who brings you her homemade blueberry jam every summer. Are you one of the lucky people who have that special neighbor who loves to make jam with fresh, seasonal berries AND share them with you?? Homemade blueberry jam is my favorite, by the way! 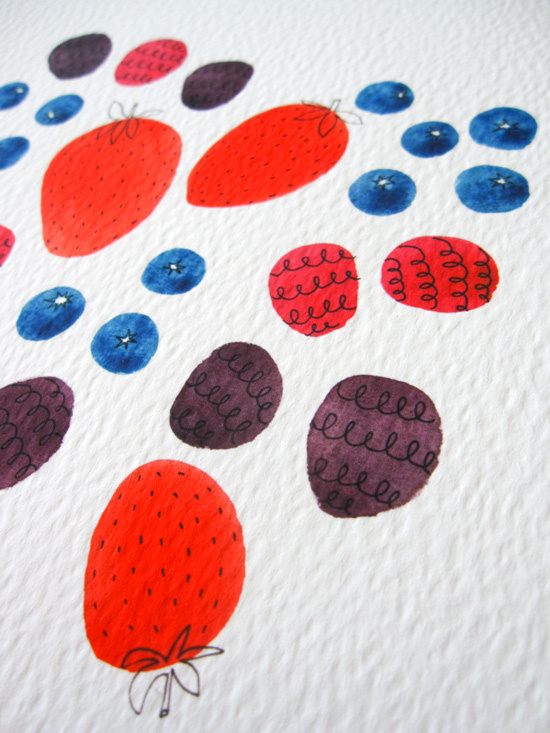 Write a thank you note in my Summer Berry notecard and tell her how much you appreciate the delicious gift! 4. Your tomatoes are doing a little too well and you don’t know what to do with all of your bounty?? Invite your friends over for a tomato canning party! I have a friend who plants lots and lots (I mean LOTS) of tomato plants every year, and she turns them into delicious tomato sauce and cans them. 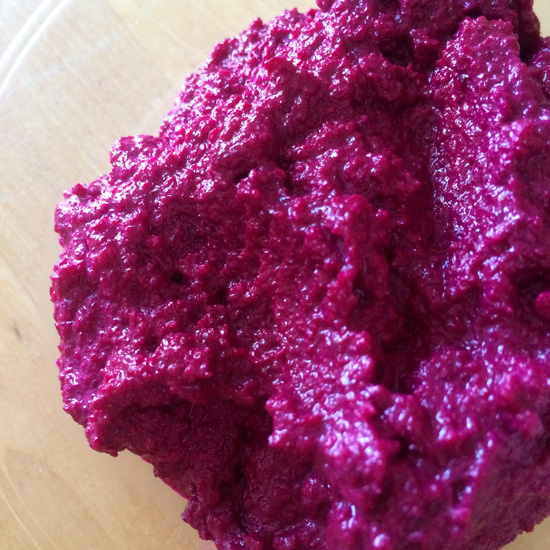 If you’re a canner, you know it is a “process.” You need to clean, peel, chop, measure, season, and cook your veggies or fruits. You prepare your jars and lids and can them in boiling water in a hot kitchen. I love canning but it can be quite time consuming and labor intensive. It’d be a lot more fun if you have your friends over and enjoy the process while catching up on your summer happenings. 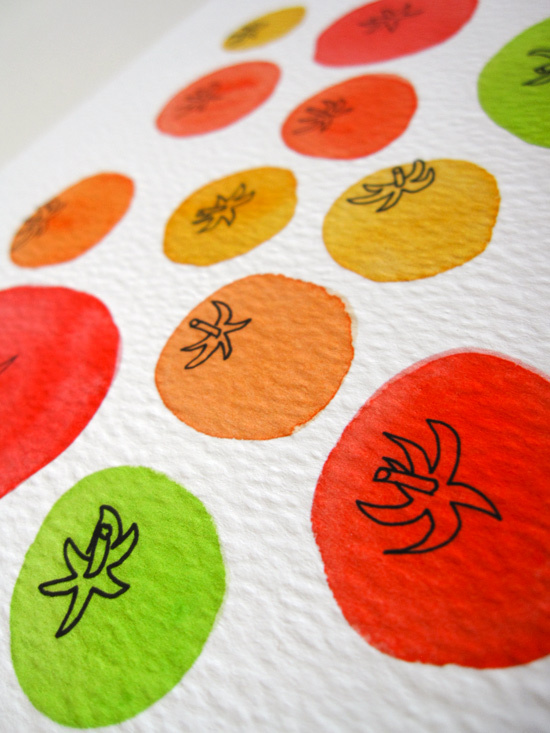 Make it a special event by sending them my Tomato notecard as a handwritten invitation! 5. 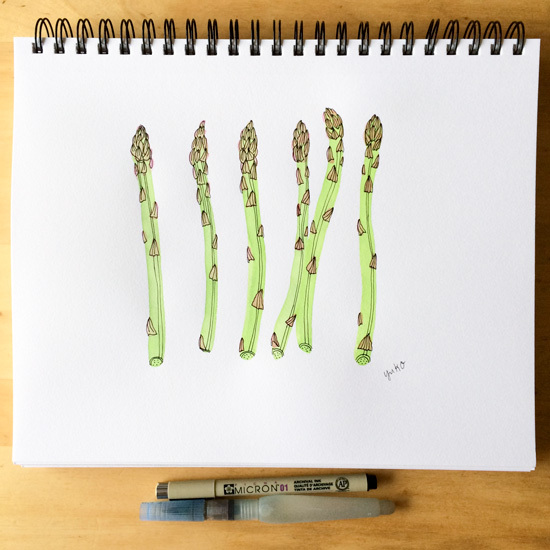 Send your family an illustrated report of what’s growing in your garden. If you live in a similar climate to Seattle and have a vegetable garden, you’re probably growing many things (if not all!) 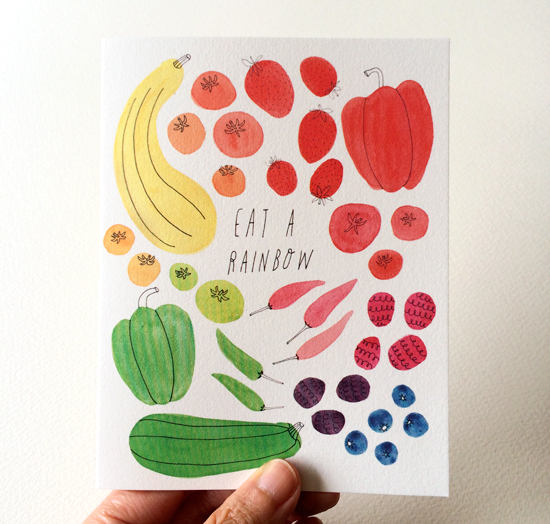 that are illustrated on my Eat a Rainbow notecard. Perhaps your parents are retired in Hawaii, or your brother lives in New Zealand. These everyday veggies we take for granted may be quite interesting to those who are not familiar. Show and tell what you’re growing in your garden this summer with your loved ones living far away. 6. Invite your friends to a garden potluck party! Are you planning an outdoor potluck, wedding, birthday, anniversary, or retirement party this summer? Get your guests excited about the fun you’re about to have by sending an invite with these notecards! 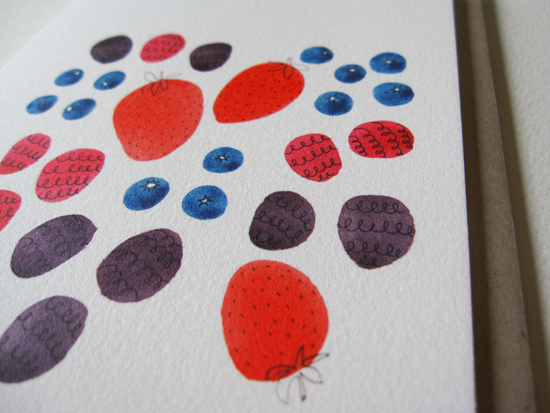 The colorful and fresh vegetables and berries on these notecards scream garden party. Invitations have already gone out? (You, organized you!) 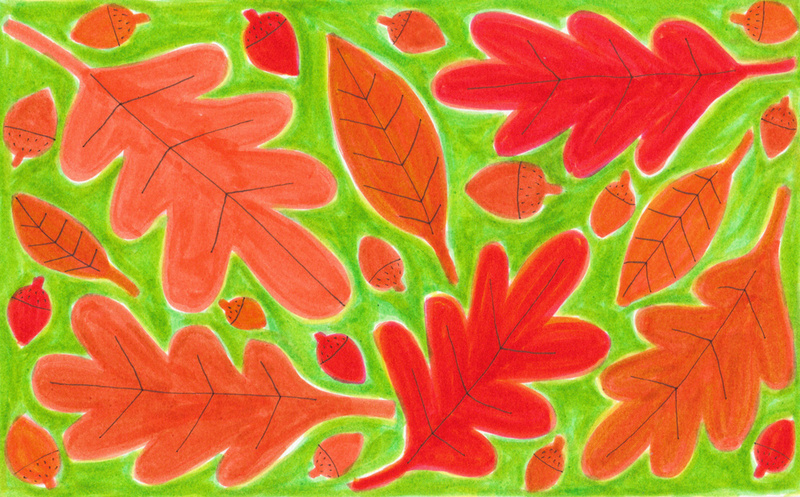 You can send your guests these notecards as a thank you card later for making your party special. 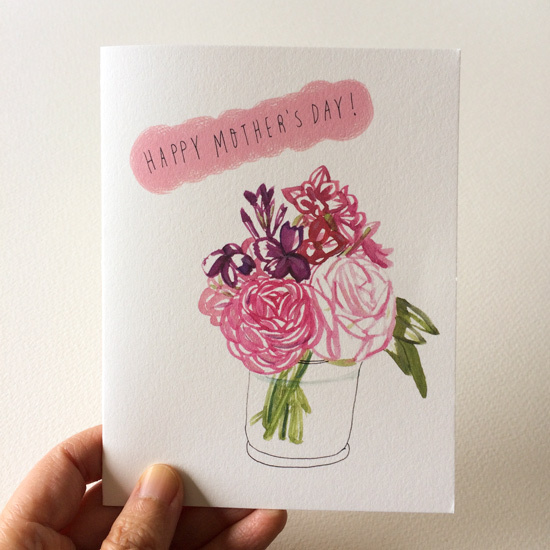 Order yours on my Etsy shop on Sunday May 1.
p.s. 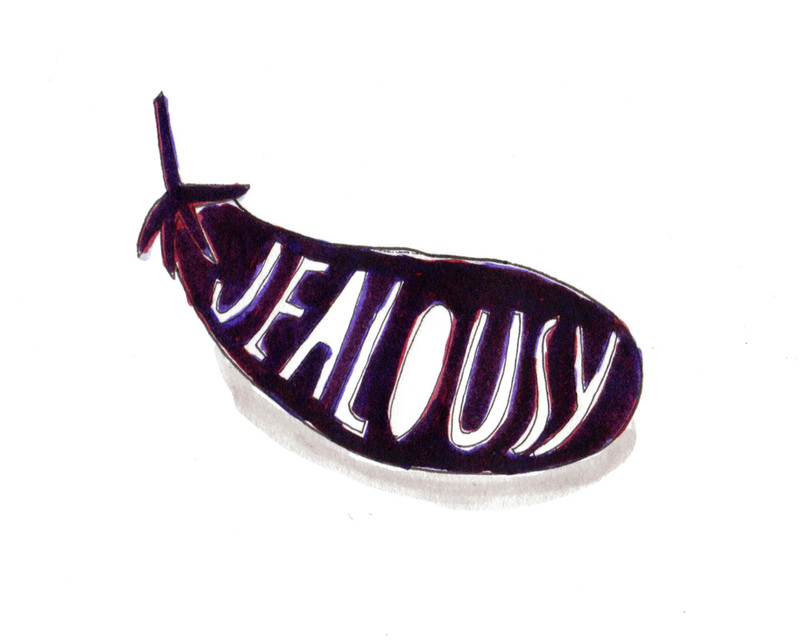 I’m going to be on my sabbatical week this coming week, and you won’t be seeing any new blog posts from me. Hope you’ll have an amazing week! I’ve been dealing with a few different digestive issues lately and discovered that eating small meals and munching on snacks between meals help me feel good physically and mentally. There is a Japanese phrase, “eating until 80% full,” as a good practice for your digestive and overall health. I guess it’s kind of a common sense that overeating is not good for you, but I’ve become more aware of it as it relates to my own health lately. 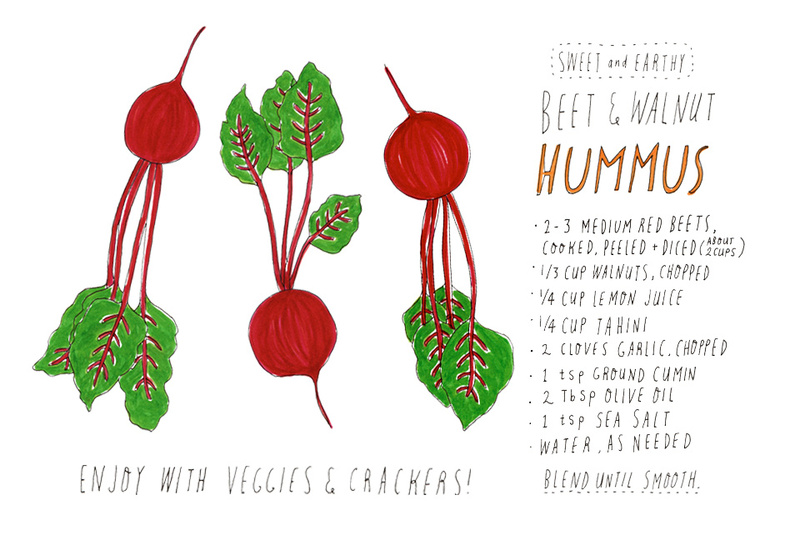 When I snack (and I LOVE to snack), I try to eat whole foods that are nutritionally rich and filling. I’m a very practical person, and if I can eat only a small portion of food at one sitting, I want more bang for the buck!! I love avocados. I’m sad that we can’t grow them here (who knows what’ll happen in some years with the climate change and everything…?) but we buy them regularly because they’re SO GOOD. I love its creamy texture and how versatile it is. 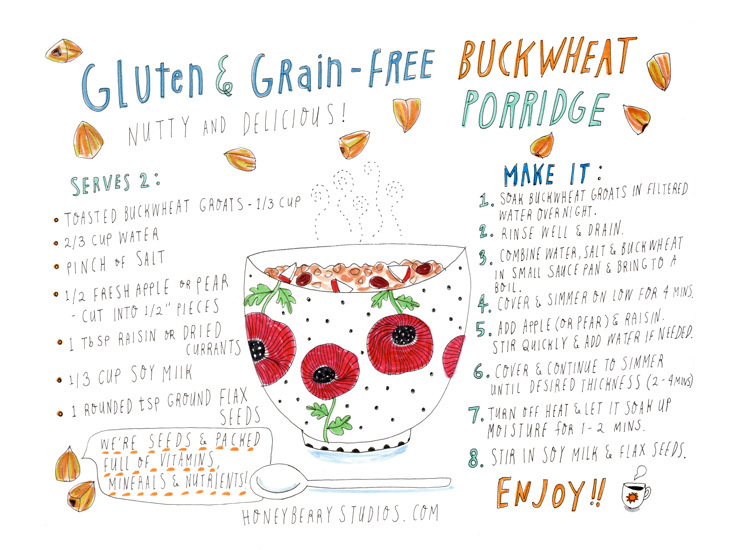 It’s packed with beneficial nutrients and vitamins (you can learn more here) and goes with practically everything. And the “good” fat and fiber it contains allow me to feel full even if I eat just a small amount of it. 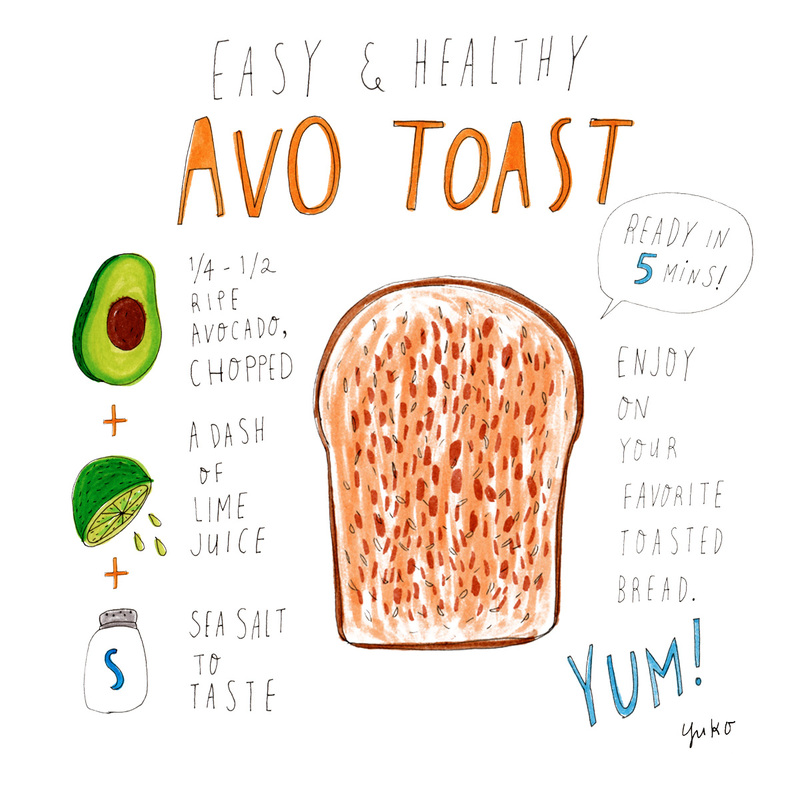 This Avo Toast has been my go-to snack between breakfast and lunch lately. The buttery, creamy avocado with a hint of refreshing lime juice and a tiny bit of sea salt on a warm, crunchy toast is simply divine. And it only takes 5 minutes to prepare, if that! I’m always looking for a recipe that takes only a handful of ingredients to make (I often get turned off when I see 7 or more ingredients in a recipe…:D), and this Avo Toast recipe is definitely a keeper! I hope you got a chance to see the sneak preview of my new summer product line, Eat a Rainbow, that’s going to launch on Sunday May 1 last week. If you missed it, go here to get a sneak preview now! It’s my first attempt to release a cohesive art product line on a regular basis (my goal is one collection per season). 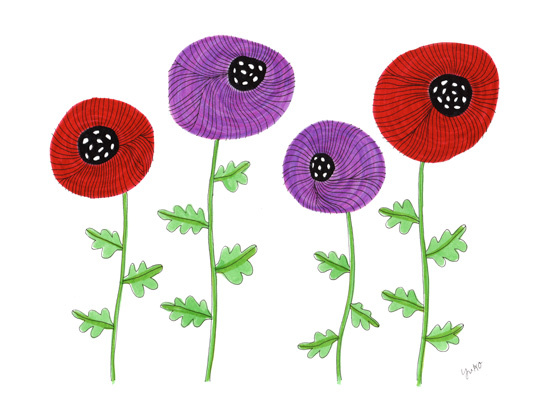 I’m starting small with just a handful of new art prints and notecards. 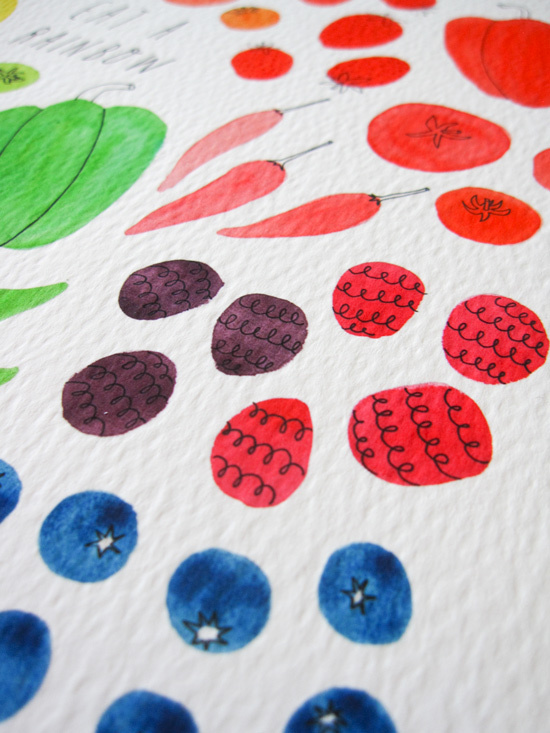 In this new collection, I’m releasing 4 new designs: Eat a Rainbow, Bell Pepper, Tomato, and Summer Berry. All things I love and look forward to in summer! Take a closer look and you’ll totally agree. Eat a Rainbow art collection will launch on Sunday May 1 🙂 Stay tuned for more updates next week! 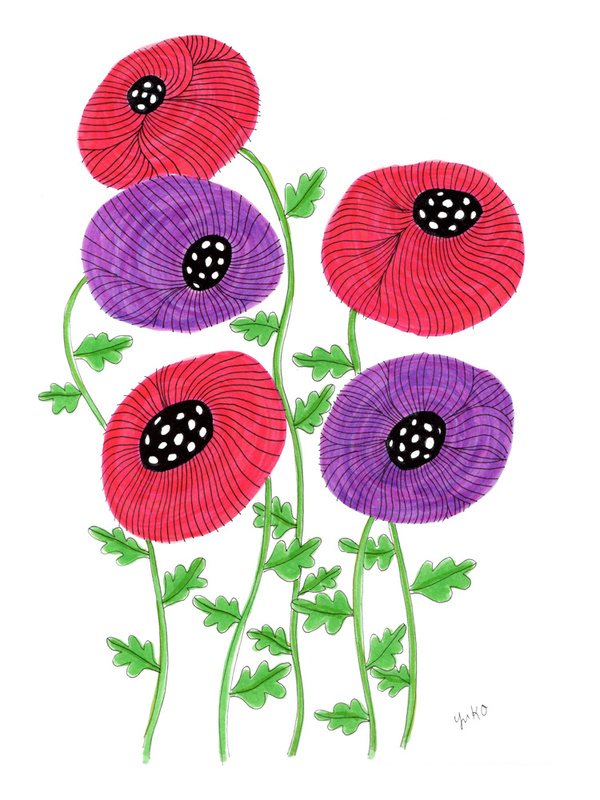 We’ve been having many beautiful sunny days in Seattle lately, and it’s getting me in the mood for drawing colorful poppies in my sketchbook! 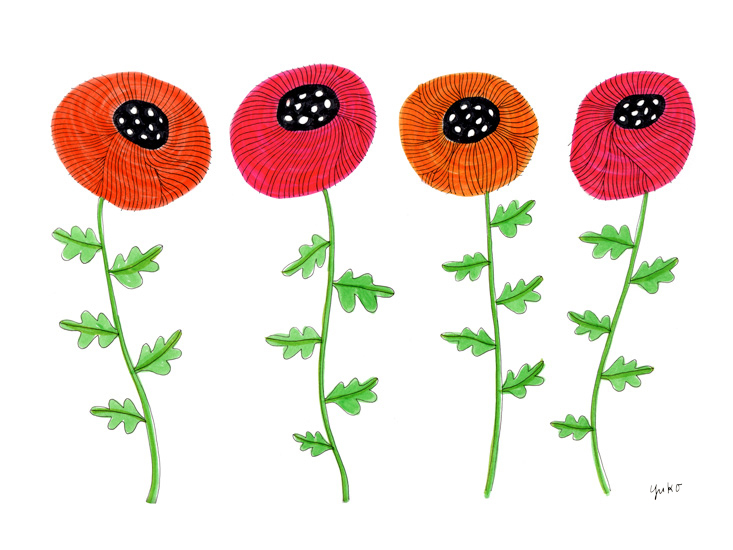 Here are some of my recent poppy drawings. I used Sakura Koi Brush pens and Micron pen (size 01). I’m going to be working on a drawing tutorial video for Sakura of America in the near future and think it might be fun to show you how to draw these? 🙂 I’ll keep you posted! 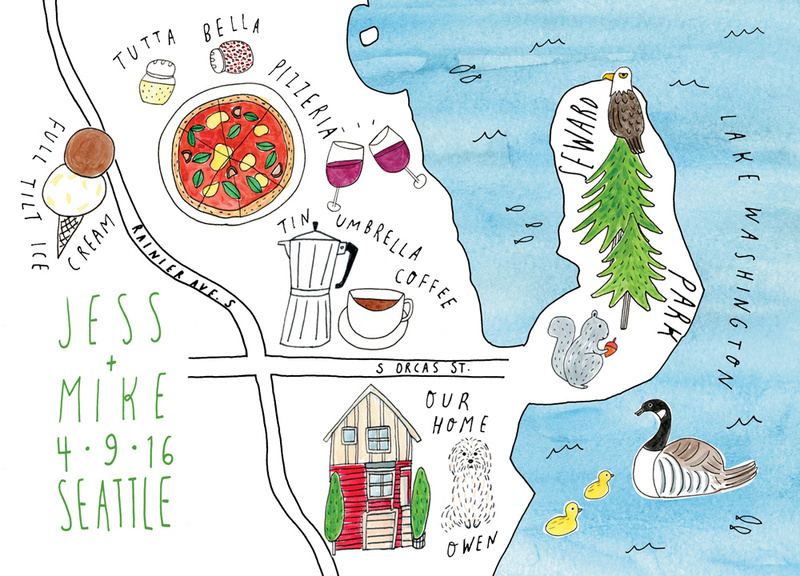 I recently worked on a map illustration for a couple for their wedding invitation. It was a really fun project, and I want to share my behind the scenes case study with you today! 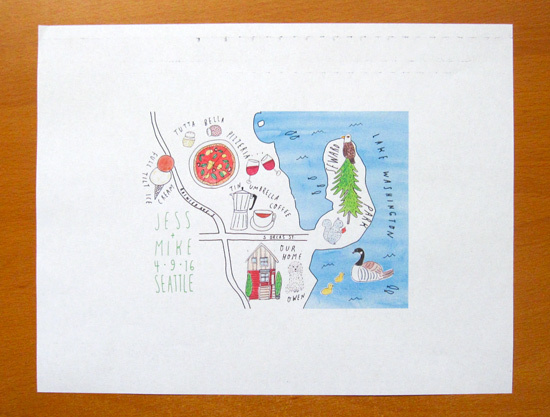 Jess and Mike approached me last fall after seeing my work from one of my 365 Day Happiness Is art shows in Seattle. They said they liked my simple pen and ink drawings with watercolor and wanted something similar done for their wedding invitation. The first thing I do when I receive an inquiry for a commission work is to thank them for their interest and send them my client questionnaire to find out more specifics about the project. My client questionnaire includes 17 questions to discover what the project goals are, what deliverables are expected, if there are any timelines, what would be a successful project, and what inspired them among other things. I got many of the questions from Seanwes’ Value Based Pricing. They teach how to charge your client based on the value you create for them rather than charging flat fee for every project or asking for a budget up front. I was really inspired by this concept that lets you position yourself as an investment rather than an expense to your client. I like having my potential client fill out the questionnaire first because it helps to clarify what the project is really worth for them. I find it especially helpful when a client says they want something quick and simple… because nothing is ever quick or simple!! And even though many clients want to know how much the fee is up front, I can’t even begin to imagine how much it’s going to be without knowing what the goal is and what will take to achieve that goal. After I got their questionnaire back, I reviewed their information and believed I could help them with what they needed. So we met for a coffee to discuss further. In our conversation, we went over their answers to the questionnaire more in depth and I was able to learn more about their personality and what they value. In a more personal project like this, it’s important that I get a picture of who they are because that’s essentially their “brand” and my final work will need to reflect that. Both Jess and Mike are from out of state and have lived in lots of different places before they moved to Seattle and met a few years ago. They had recently moved to their new home in the neighborhood and love exploring what their new neighborhood has to offer. Many of their wedding guests will be coming from out of town and have never been to Seattle before. They wanted the illustration to give their friends and family a glimpse into their new life together and get excited about visiting Seattle. From our discussion, we decided it’s going to be an illustrated map of the neighborhood, including some of the landmarks that are meaningful to them. I’ve always liked illustrated maps. 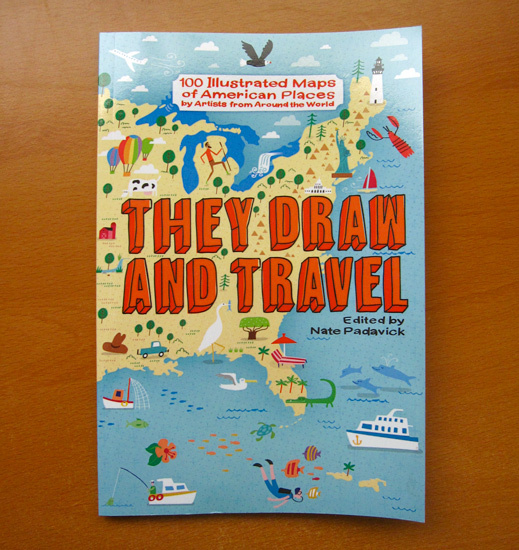 One of my favorite illustration websites, They Draw and Travel, had just released their book of illustrated maps so I got it for more inspiration and research. It was a perfect timing and the book is a treat for the eyes!! After our meeting, I put together a proposal (which also doubles as the contract) outlining my understanding of the objectives, timeline for everything, what deliverables they’re going to receive and how they’re going to receive them, and the fee estimate. They agreed on the terms and paid the fee (I typically ask to be paid up front), so I put them on my project queue to work on. The nice thing about requiring a payment up front is at least you know you don’t have to worry about getting paid afterwards! It really helps me focus on the project, and as a result, do a better job for my clients. It’s a win-win! I start my work by researching and gathering reference materials. I want to understand the subject as much as possible so I can translate their vision into a visual representation in a best way possible. During my discovery process, it became apparent that my illustration needed to reflect their love for the neighborhood and how it’s a big part of their new life together. Since I also live in the neighborhood, I’m familiar with the landmarks and the feeling they’re referring to. But I’ve never really paid attention to the details of what’s there, so I took an afternoon to walk around and explore more. For example, I went to their house and took some photos and got the feel for what’s around. I also visited the other landmarks they mentioned and looked around a bit and snapped some photos. I gathered some other reference photos online as well and read about what animals and trees grow around here. After I get my research done, I start sketching elements and concepts. I make several concept sketches in pencil. When I get a good idea of what to include in the piece, I create a rough sketch with pencil on paper. 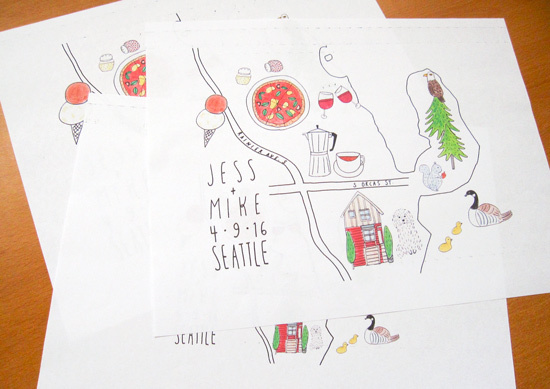 Here, I drew a couple of boxes in the same size as their invitation so I knew exactly the size I was working with. After I decide on the general concept, I trace several aspects of different versions of my rough sketch on to a tracing paper and create a little more polished version of my concept sketch. I do however show my client the initial concept sketch just so they know which directions I’m headed. If they have any objective feedback, like hey, you misspelled a name or it is way outside of the vision for the project, then I’ll take that into consideration moving forward. Once we agree that we’re on the right track, I’ll continue working on the piece, revising and refining it many times to ensure it is going to meet the project goal. 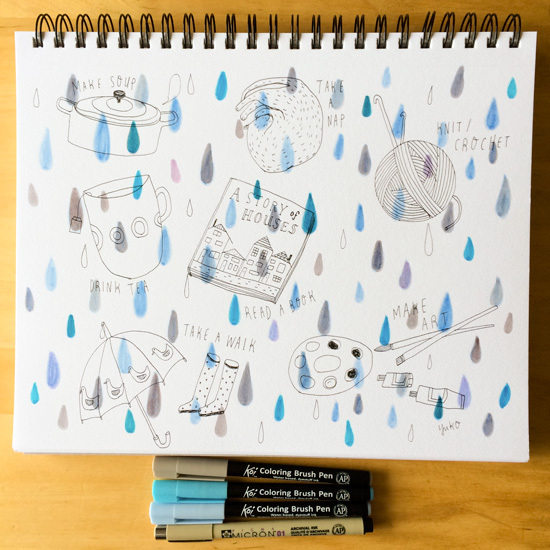 I create drawings of each of the elements separately in my Canson Mixed Media sketchbook. I usually start drawing with pen and ink directly with my Micron pen (used size 08 for this project) to create my whimsical and organic illustration style. 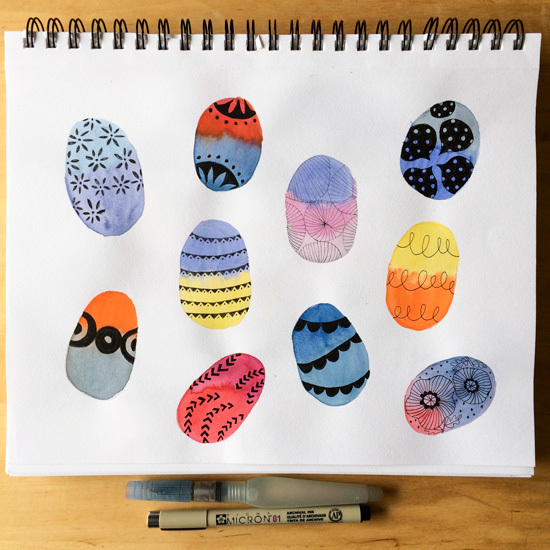 And then I colored them with watercolor and gouache (various brands). I wanted to make sure the overall feel of the piece fits my signature drawing style, so I paid attention not to overdo anything. I drew a few versions of each elements (i.e. building, trees etc.) and chose the one that would work the best. I then cut them out of my sketchbook pages and taped them on to a sheet of paper and scanned them in. I do this because my scanner is not very big, and it’s kind of a pain to scan the 9×12 page, and I can save time by scanning only pieces I needed. 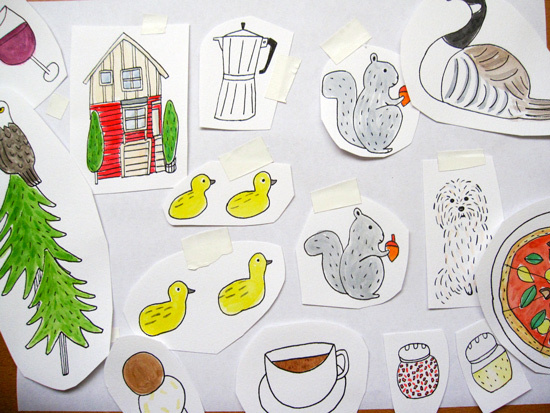 Bits and pieces of my illustrated elements to be included in the map. 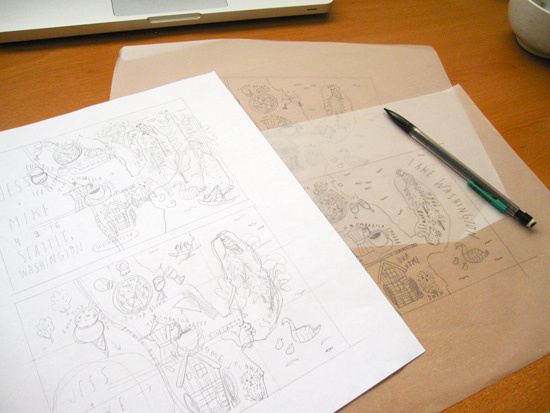 Once I scan the hand-drawn pieces, I bring them into Photoshop and edit them (e.g. enhance colors, clean up the messiness etc.) to get them ready to be added to the map. To draw the outline of the map, I pulled up Google map of the neighborhood and sketched it a few times on paper to practice. Drawing maps can be tricky. Though I’m not trying to create a realistic map, it still needs to be somewhat recognizable as the map of the area. I ended up using a grid drawing method (here is a quick tutorial about the method if you’re interested) to get the general shape and proportions accurately. 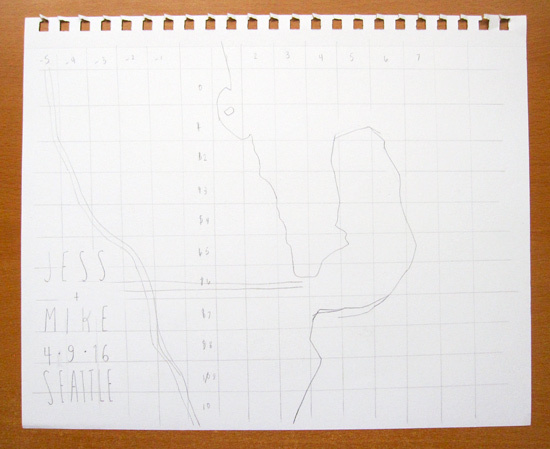 Here is the outline of the map created using the grid drawing method. I traced the map with the pen on the tracing paper and scanned it to be digitally manipulated. Once I have the outline of the map and the illustrated pieces scanned and edited, I began to put them together in Photoshop, referring to the concept sketch I made initially. I also print out the artwork several times during this process to make sure it’s legible and readable in the format the artwork is going to be used. Although you can’t really guarantee how the colors will be rendered on their end, it’s a good idea to check how they turn out from your printer. It’s always little different than what you see on your monitor! 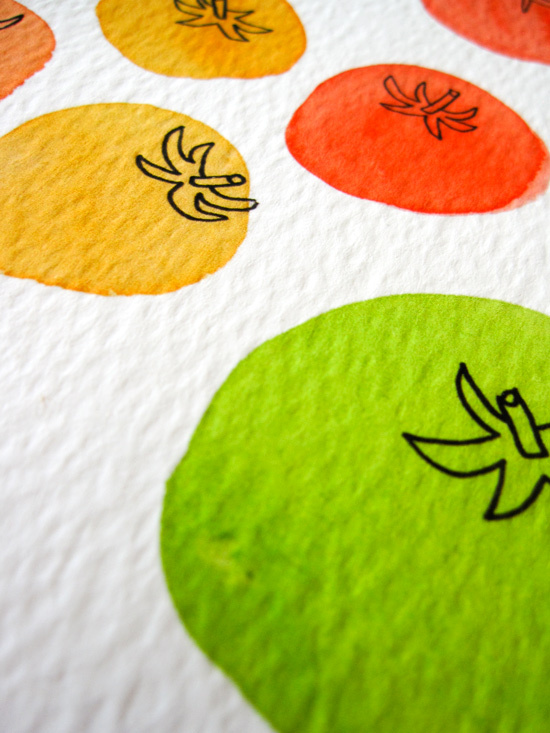 I print out the artwork several times during the process. I print it out in a larger size to look at the details and also in the smaller size (the size of the wedding invitation) to make sure everything still looks OK. I keep revising and tweaking. It could be a pretty tedious process! Once I’m happy with the general layout, I create the lettering pieces to fit in the space. Again, I make a few different options, decide which ones would work best, scan them in, edit them in Photoshop, and bring them in to the artwork. With the lettering pieces in a general place, I do the layout, tweak it a little bit, look at it carefully, print it out if necessary and repeat the process until I feel good about it. Once you’re done with all the revisions, it’s time to submit the final files to your client! Hooray! For this client, I created a high-resolution PDF file for print and a low-res jpeg file for web (in case they wanted to share the work online with friends and family) and sent them via Dropbox. It’s always a little nerve-racking to wait to hear back from the client after you hit the “send” button. Even though I know my work is good and I did everything I could to meet the project expectations, I often get anxious wondering if they’d agree! Jess and Mike wrote back a few days later to tell me how much they loved the artwork 🙂 They loved it so much that they asked me to create the lettering work that goes inside of their invitation. I love it when a client is so happy with my work that they give me more work immediately! And here is the final artwork for their wedding invitation! I hope you enjoyed the behind the scenes look into my illustrated map project! Jess and Mike were great to work with, and I had a lot of fun creating this custom piece for them. Happy April! Wow how time flies! I hope you’re adjusting to the seasonal changes OK! I’ve said this before but when I quit my day job last summer, I thought I was going to have all the time I wanted to make art every day. It turns out there are so many other business-y things I needed to take care of, and sadly making art for the sake of making art had taken a back seat in my life. I was feeling a little burnt out leading up to my last sabbatical and was worried I was losing my sparks. So during my sabbatical, I was determined to just relax and make whatever, whenever I felt like it. As a result, I felt rested and spacious. I got to rediscover the joy of making art as a way of relaxation and self-care. After all, that is what art was to me in the beginning – something that fed my soul, and it can still be that if I created a space for it. 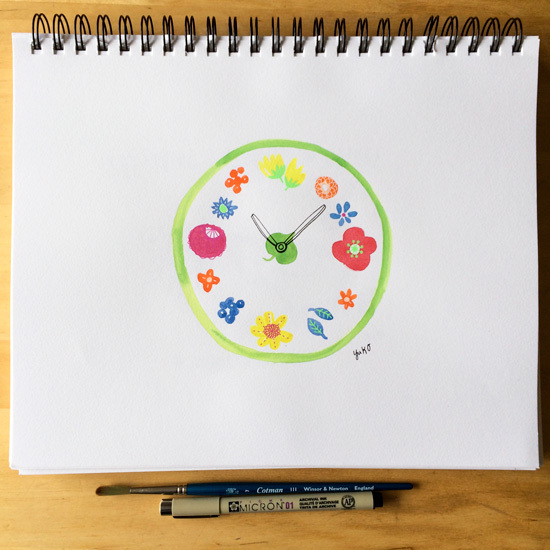 I was definitely losing touch with that aspect of art making as I was buried deep in the day-to-day, trying to make my creative business happen. And I really wanted to have it again in my everyday living. I realize it’s nearly impossible to create art just for fun any more. 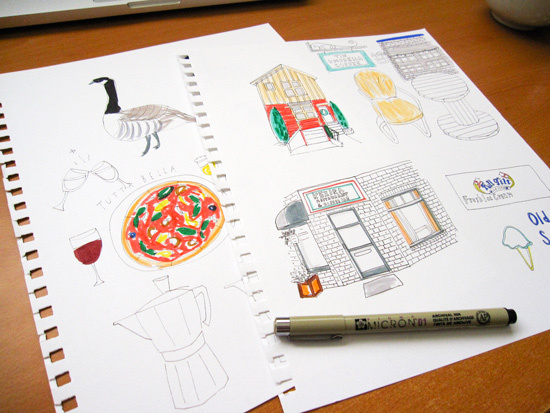 I’m always thinking about what’s next for my business and how even my fun, “non-work” art can help me achieve my goal. But I’ve been attempting to restore the balance and making art as part of my daily relaxation practice as well. I’ve been taking time off from my business/admin stuff mid-day or at the end of the day to draw something fun and joyful. Some of them will be part of my portfolio or my future work, and others will just live in my sketchbook. It’s been so nice to have that space in my life again. I didn’t realize how much I craved it and how good it is for me personally and professionally. Do you have a task or two (or five) that you’ve been putting off? You just can’t get motivated to get started for whatever reasons. Maybe it’s too overwhelming, or maybe it’s a boring and time consuming task that you hate. For me, updating my art and illustration portfolio is one of those things. Which is terrible considering that’s very important to my work!!! 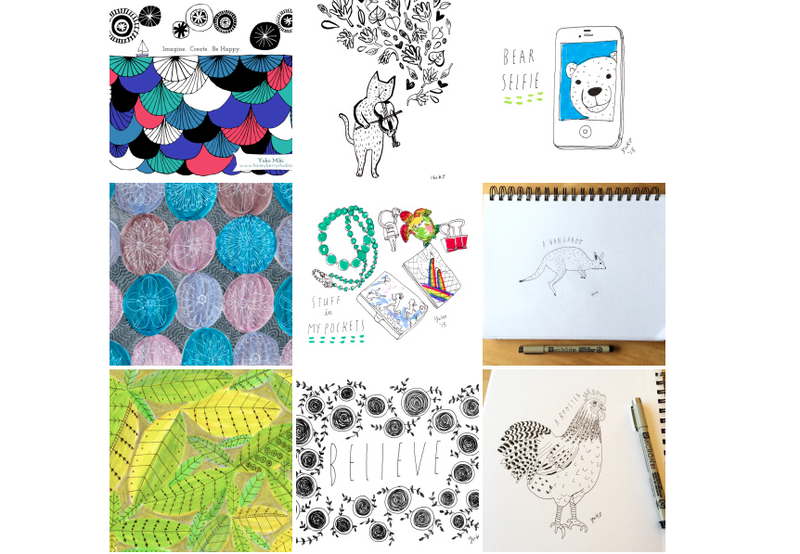 I created my online portfolio 2 years ago in my Graphic Design certificate program at a local college. It was a requirement to put one together to graduate from the program. I got a domain name “yukomiki.com” (glad it was still available!) and used the same WordPress template I use for my blog (Twenty Thirteen theme) to create one. At that time, I was still thinking I wanted to be a designer rather than an artist/illustrator because I didn’t think being the latter was a viable option for me. I believed being a working artist was something reserved for only super talented and special people. I didn’t think I was that person. But then in my very last class after my portfolio presentation, my instructor saw that art and illustration was my true passion and encouraged me to follow my passion rather than settling to pursue design, which I sort of liked but not really. And just like that, I decided I’d pursue art and illustration more seriously! So anyway, my portfolio had a bunch of work that were more focused on design projects from school. I’d worked very hard to put it together and was kind of over it when it was done. And left it alone for the past 2 years!! Yikes. Needless to say, my work has changed since then. But my portfolio still had a bunch of old logo designs and wedding invitation designs which I didn’t really want to do any more. Because I was feeling kind of embarrassed about my outdated portfolio, I hid it deep inside my website and didn’t really promote it for a long time. I was making more work but did’t bother to update my portfolio for so long. I would post my new work on my social media so I figured, people can just find my work there, right? Or go to my Etsy store to see my new products, yes? I also didn’t like the fact that my website and portfolio (and my blog for that matter) all lived at a different place – my website is self-hosted vs. my portfolio and blog are hosted on WordPress.com. I do my own design for the website (html and css all the way!) but use the template for WordPress for blog and portfolio because my coding skills are pretty limited. I’ve been wanting to do an overhaul and get everything on one platform and thought that would be a good time for me to update the portfolio all together. But that’s a huge task and I haven’t gotten around to it. And when I realized I didn’t have a clear timeline for it, I just didn’t want to wait any longer. So the other day, I went into my portfolio site and spent a couple hours getting rid of old categories and pages and just made one simple page where you can see a bunch of my new work. I kept the same WordPress theme (Twenty Thirteen, same as this blog) to keep a somewhat consistent look. And I used their portfolio feature with square grid to organize the page to keep it clean and simple. 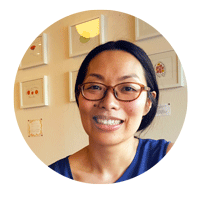 I chose pieces that show my current style and focused on work that I’d like to do more of. It’s a place for people to find more curated work of mine rather than seeing different bits and pieces on social media. It’s still work in progress but at least my work is fresh and I don’t feel so embarrassed about it any more 😀 Since I got rid of a bunch of pages and categories, adding new work will be a lot easier, too, and that should make it easier for me to keep it updated! 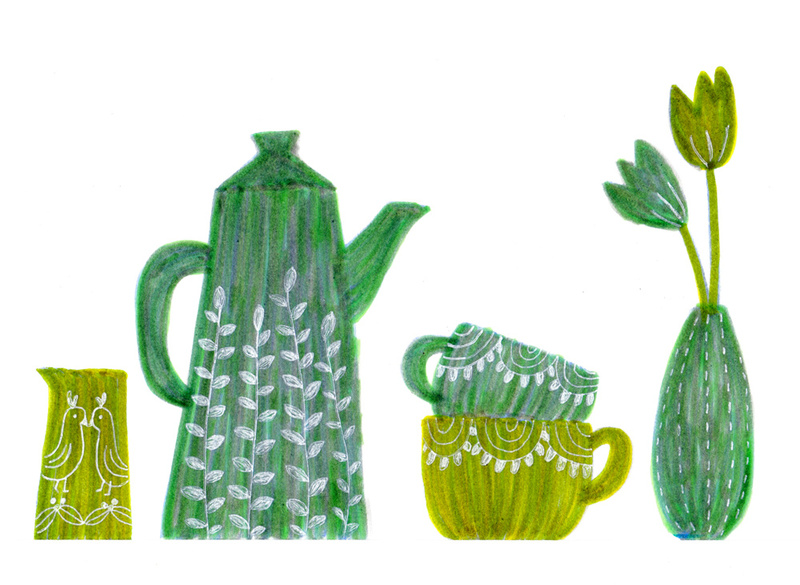 You can visit my updated illustration portfolio here if you’re interested! I hope you enjoy what you see. I love sharing the tools I use and love. 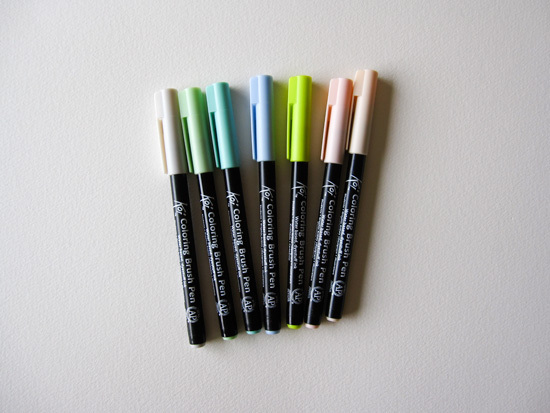 Today I want to tell you why I love using Sakura Koi Coloring Brush Pens a.k.a. Koi Pens for my drawings! 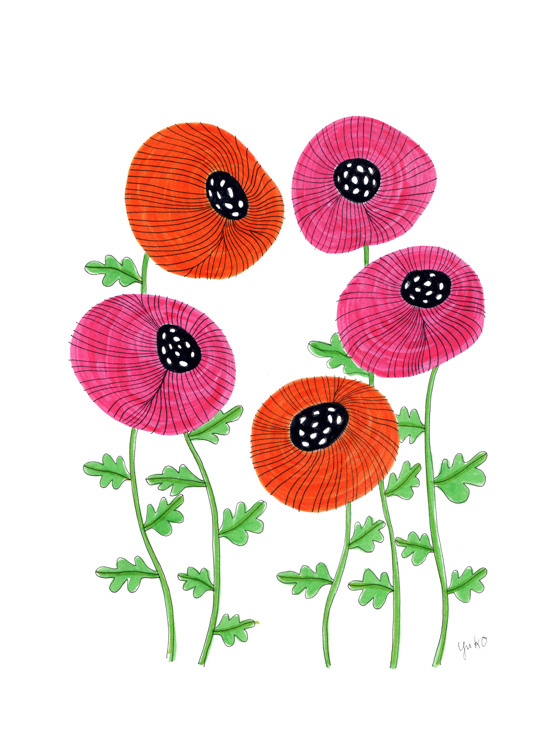 I started using them after seeing my favorite artist Lisa Congdon use them. 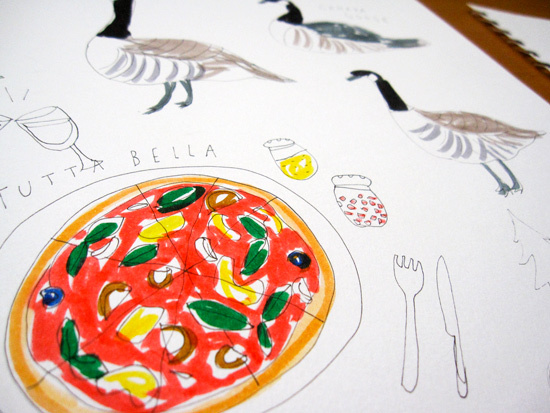 Many of her drawings are so colorful and lovely and made me want to try them, too! 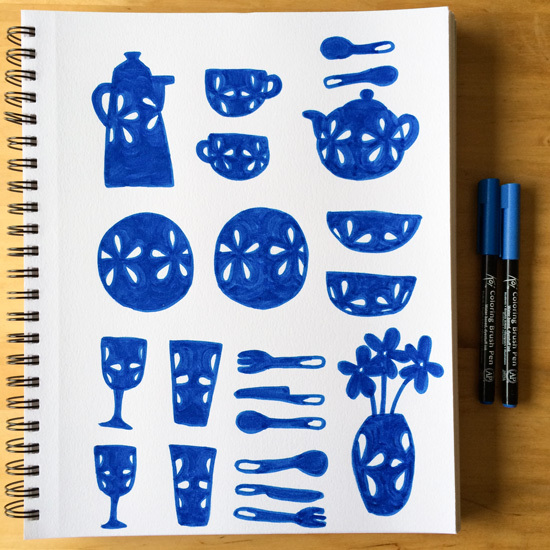 Here are 6 reasons why I love drawing with Sakura Koi Brush Pens! Koi Pens come in 48 brilliant colors! I first started with their 12 color set and gradually added more colors I wanted to try. My local art stores carry the sets but not individual pens, so I just bought additional individual colors online on Sakura’s website, which was sort of a pain, but not terrible. And then when Sakura approached me to be their guest Instagrammer last year, they sent me a very nice care package of awesome art supplies, which expanded my collection. They’ve sent me the 48 color set recently (Merry Christmas to me!!) and I love trying them all. 48 color set comes in a fancy container, too. When you get their 48 color set, it comes with the card stock insert you can see in the picture above. 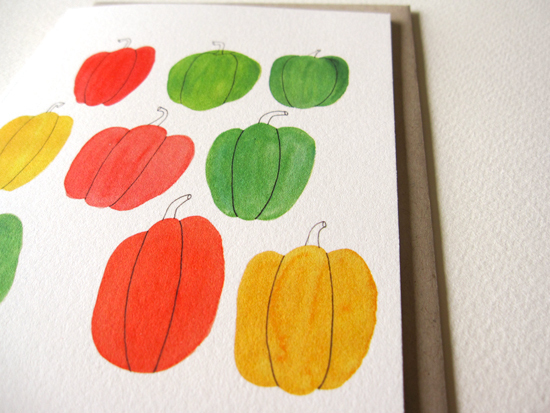 The back of the insert doubles as a handy color chart! One morning, I had a lot of fun filling in the chart with all their pretty colors 🙂 You can also create your own color chart pretty easily. Color chart is nice to have especially when you have so many different colors to play with! 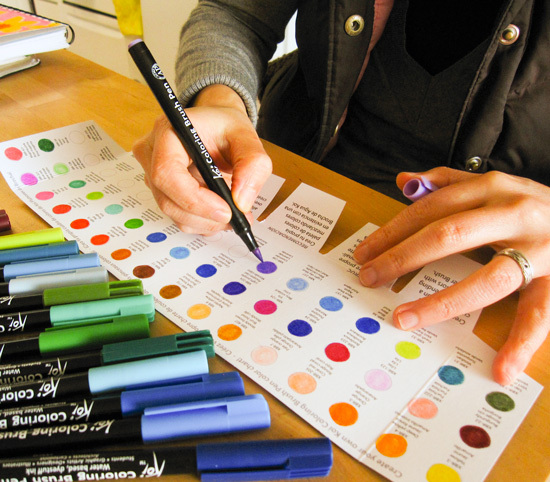 Some colors are not exactly the same as the color of the cap, so the color chart can help you see what it actually looks like on paper. Some of the colors I use A LOT in my drawings are: Light Cool Gray, Ice Green, Peacock Green, Light Sky Blue, Fresh Green, Pale Orange, and Naples Yellow. These are all pretty subtle colors and I use them often to blend and layer with other colors. 2. They blend and layer nicely. 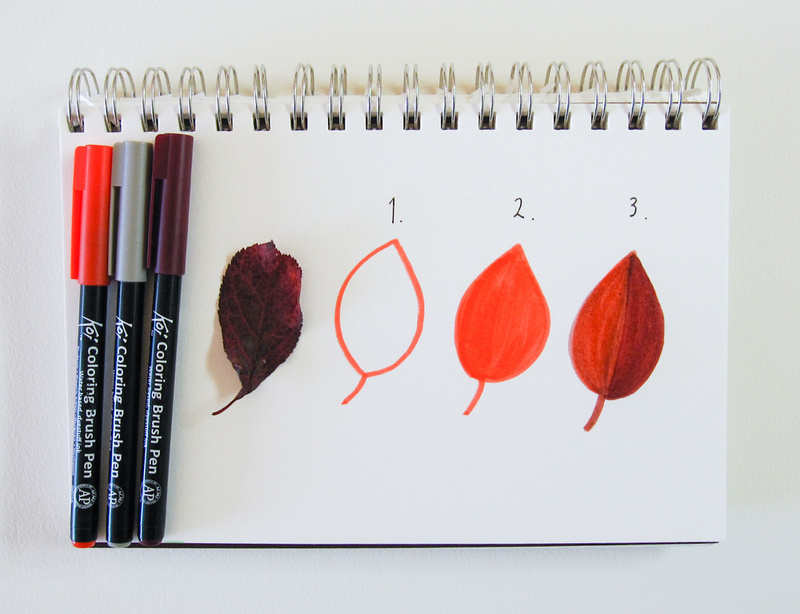 Speaking of blending and layering, they’re transparent and you can easily create your own colors much like watercolor. 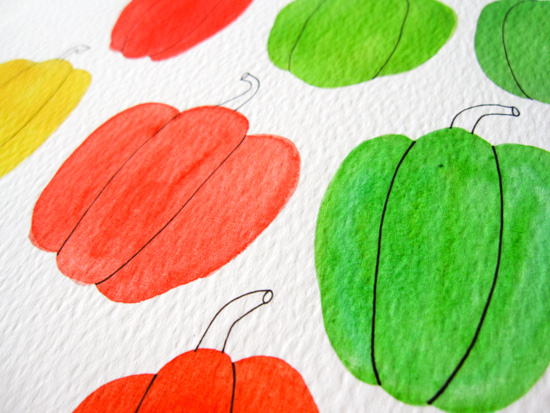 I often layer 2 or 3 colors to create different colors and add depth to my drawings. To do so, I often draw with the lighter colors first and layer darker colors on top. You can see the example from a drawing tutorial I created last year. I don’t typically do this, but you can also blend the colors together by using watercolor brush and water or their colorless blender pens. 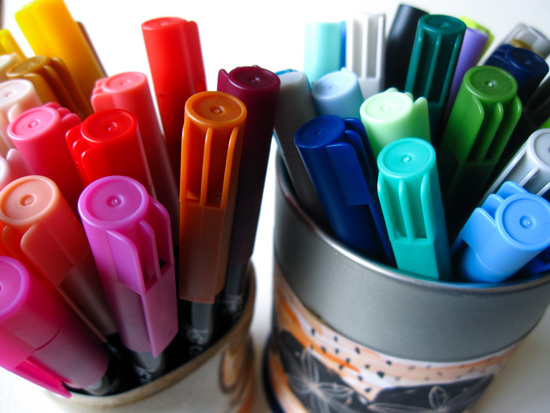 I didn’t even think about this until I reviewed their product information more in depth to write this post, but Koi Pens are water-based and odorless. Which is a good thing because I’m pretty sensitive to smell and some art supplies with odor give me a headache. 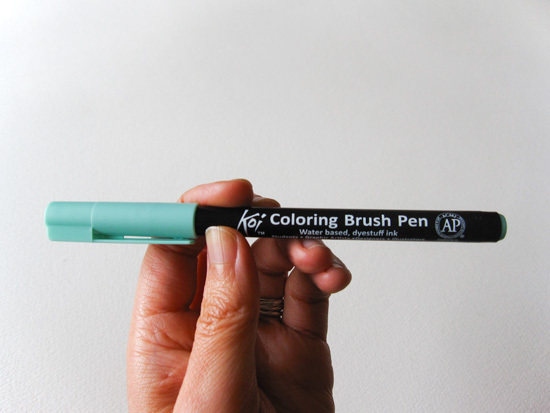 Though this is not exactly like using a brush, it does allow some flexibility and you can change the thickness of your brush strokes somewhat by adjusting the pressure you add to the tip. 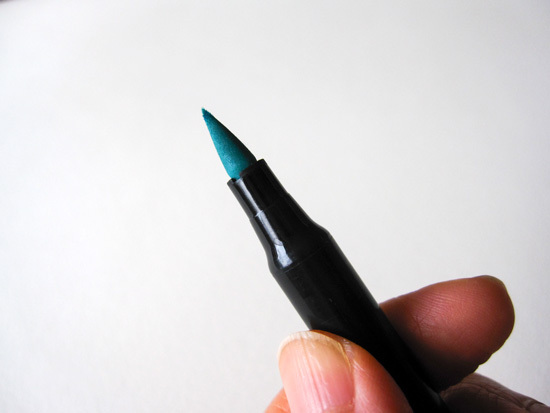 When you first start using it, it’ll be a little stiffer so it’ll be easier to draw fine lines. As you use it more, you’ll break them in and the tips will be more flexible. The tips do become a little flared with more use, and making fine details may become difficult. If you want to keep it fine, you might just want to get two of the same color and try to designate one for fine tip and the other for medium/bold. One of the reasons why I love the Koi Pens so much is because it’s so portable. 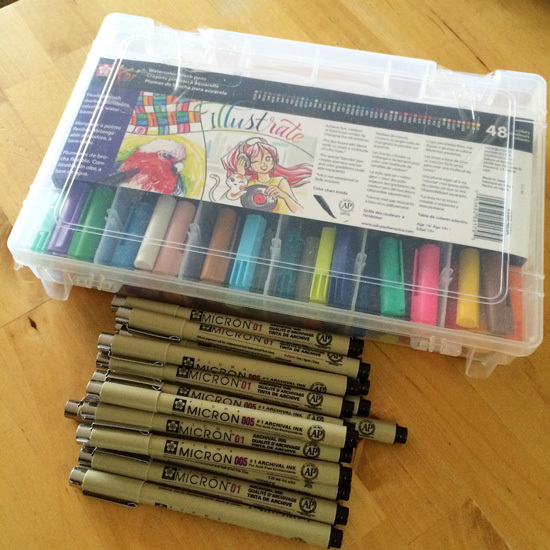 When you’re drawing with these, there is no need to set up – you just grab what you need and the way we go! I have a little zip pouch I carry my favorite micron pens and koi pens in when I’m out and about so if I have some extra time, I can draw and sketch anywhere. I’ve never had any issues with leakage either while I’m carrying them around. Unlike using paints and brush, there is no need for clean-up afterwards! As a busy artist, this is a great news. I know often people want to have a consistent art practice but are discouraged by the hassles of set-up and clean-up. With these Koi pens, set-up is as easy as grabbing your pens and there is no mess to clean up afterwards! Even if you make a mess or get some on your hands, it’s easy to clean up with water/soap because they’re water-based. I store them in two groups – warm and cool colors. I didn’t think markers would be my go-to medium before, but these Koi Pens had totally changed my view on markers and broadened my artistic horizon! 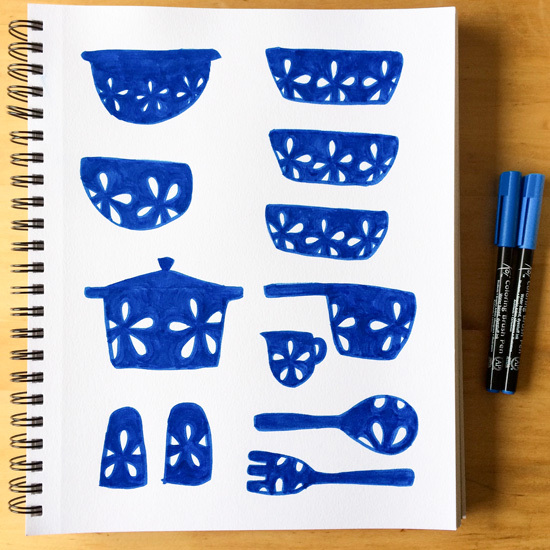 If you’re looking for new and fun drawing tools, definitely give them a try!